Dark Arts Books’ fifth title was unveiled at the Bram Stoker Convention Weekend in Burbank, California in June 2009! Unwise… Gemma Files wants you to see what happens when you look too closely into places and things better left unknown. From the agony of unrelenting grief to the desperation of spontaneously-combusting convicts, from the grim battle between a human monster and his otherworldy competition to the salacious secret life of Ro-Man(!). All this and more in strange worlds vividly painted by four supremely talented authors – worlds that are twisted, cruel and mighty unclean. When you order a physical copy of Mighty Unclean, you can also get a free e-book version of the book. Click the Add To Cart button above and answer the question during the PayPal shopping cart checkout process and we’ll send the e-book version your way when we ship the paper copy! 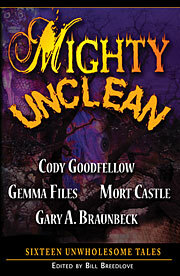 Yet another 4-author collection from the always reliable Dark Arts Books, MIGHTY UNCLEAN is perhaps the most diverse one in their catalog (which can be good or bad, depending on just how strange you like your horror). Explicit, almost hallucinogenic … lyrical…existentially terrifying…The work of each author in Mighty Unclean is a unique literary world unto itself.